I grew up eating Romano's Stromboli's. 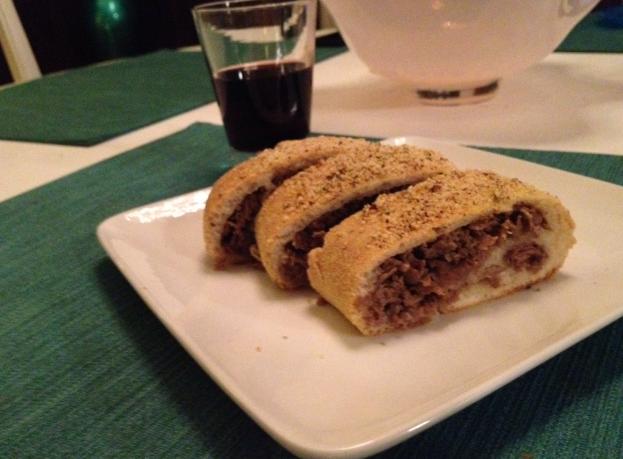 These are the best and only Stromboli's that I will eat (other than my own, of course)! 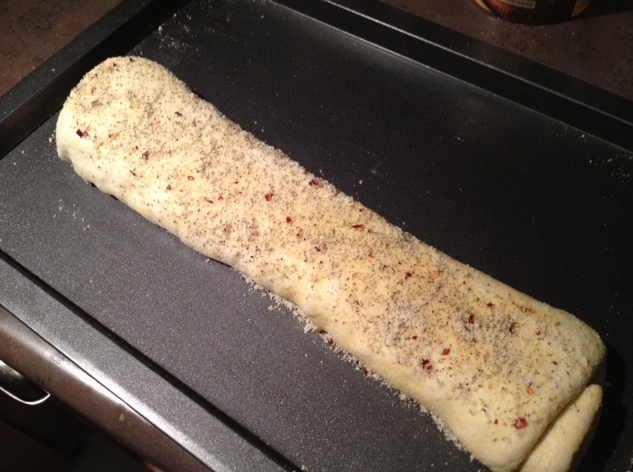 They are so different from what most pizza shops call a Stromboli. They aren't greasy, the bread is amazing and if you've never had one you are missing out. They will ship anywhere so my advice is to order one up for yourself and taste it. 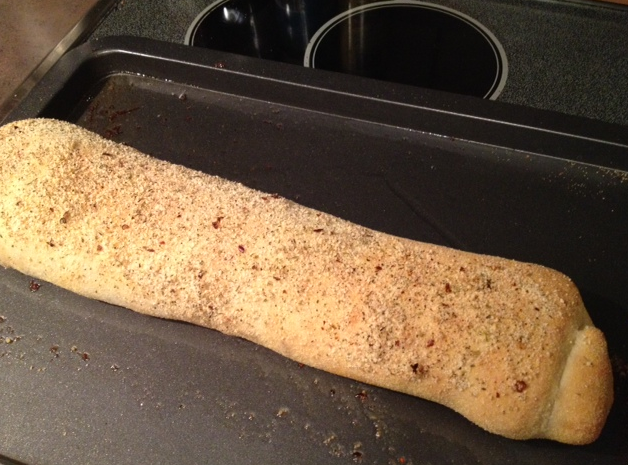 With that said, my stromboli is very different from Romano's, but I think quite tasty. I started out making an Italian version with Cooper Sharp Cheese, Pepper Ham, Pepperoni and Salami. I used to make this a lot when my sister and brother in law lived with us. Every Tuesday I'd make one of my versions (usually mini versions so everyone had their own) and we'd settle in and watch 24. I love me some Jack Bauer. The one I made last night is a cheese steak version and great for a superbowl party, especially since we are 800 miles away from a proper cheesesteak! I used Steak-Ums (Philly peeps don't hate...Its the best I can do in Middle Tennessee) and Boars Head Sharp American Cheese. 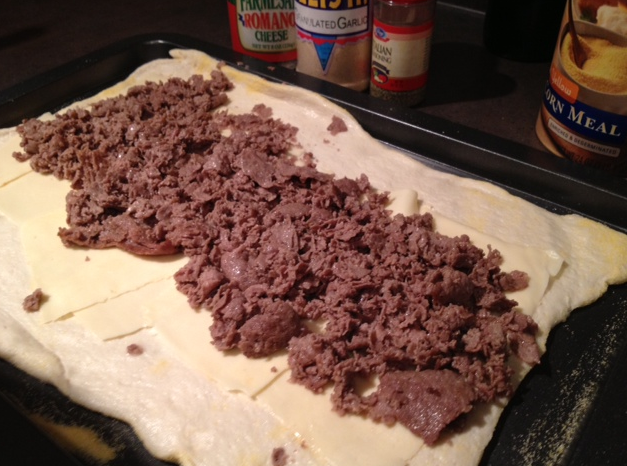 I also used a tube of pre made Pizza dough although buying dough from your favorite pizza shop is recommended. If you call ahead they will usually sell you a ball of dough for $2-3 each. 1. 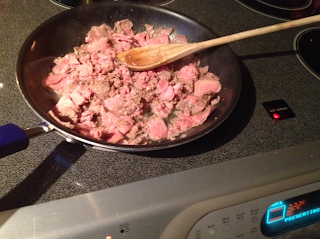 Start by browning and seasoning your steak. I use a seasoning salt from Mortons that I use on almost everything! 2. 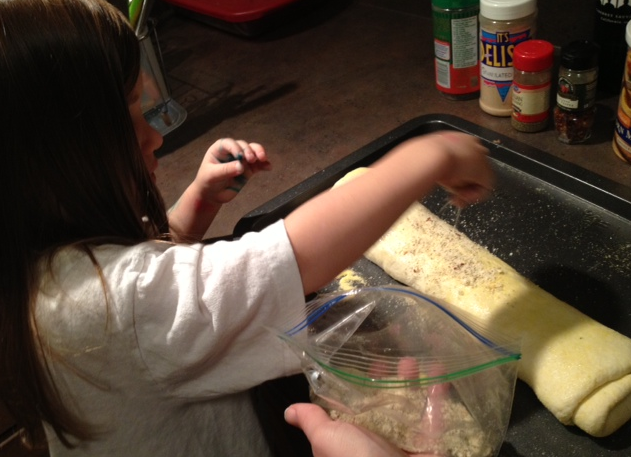 Roll out your dough onto a baking sheet lined with Corn Meal. This give it a better texture on the bottom but you could use Flour if you didn't have the corn meal. This is also a great meal to have your kids help you with. 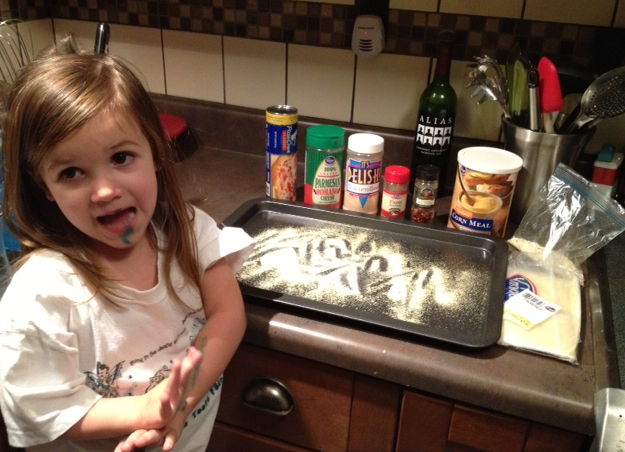 EM loves to cook with me and she does almost every night. And yes, that is marker ALL OVER EM! She had it on her face and arms. They claimed to be washable markers, but it is still all over her. Yes, mother of the year indeed! 5. 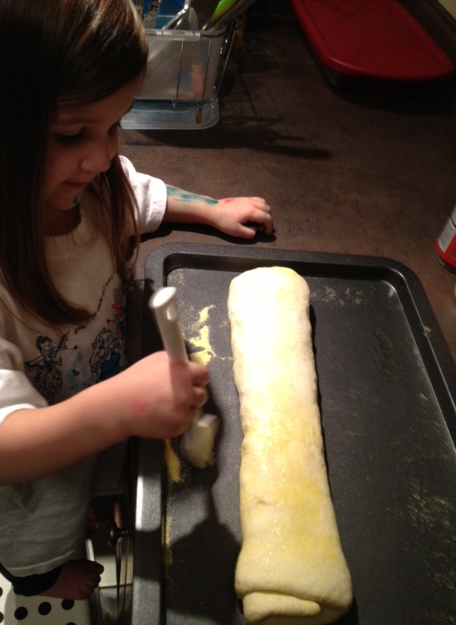 Top with this amazing topping that I think makes the 'boli! Its from a recipe I found years ago from Rachael Ray...who by the way I owe all of my culinary abilities too. I couldn't make anything until I started watching her about 10 years ago! I mix Parmesan Romano Cheese, Italian Seasoning, Garlic Powder and Crushed Red Pepper Flake together in a ziploc bag and sprinkle on the top. I don't measure anything (got this from Racheal Ray I think!) so I just "eyeball" it. If I have leftover I pop it in the fridge for later. Please excuse the shotty pictures...they were taken with my iphone. Wasn't planning on blogging about it, but I have had a few people text me recently for the recipe. You can do this so many ways...Pepperoni and Cheese, Buffalo Chicken and Blue Cheese, Italian, etc.